Round 1 of Christmas decorating was doing up my mantle. 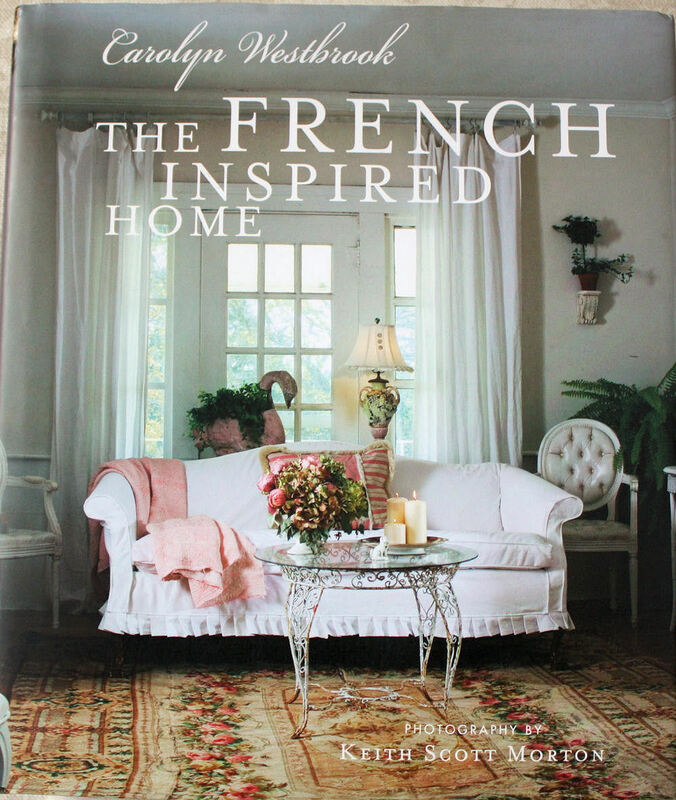 I love Jeanne d'Arc Living magazine and their books, but my taste runs a bit more fancy. What's a girl to do? Well, I am a firm believer that if you love different things, somehow you will make them work together. 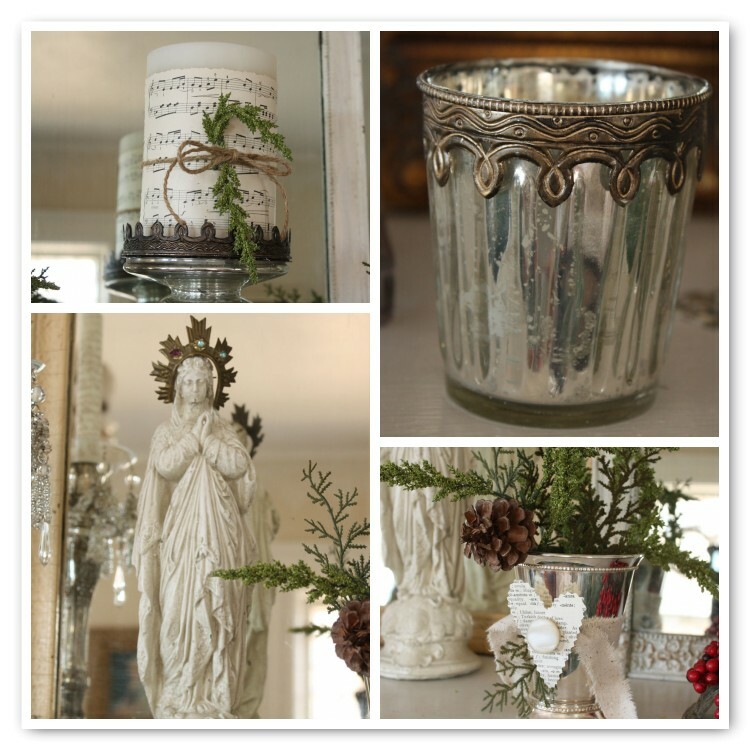 I combined my new mercury glass candle pedestal and votive holders from Pottery Barn with my antique mercury glass vases and candlestick. I added a JDL madonna with antique crown and some repro silver candlesticks that I had previously dolled up with new crystal bobeches (which had to be dolled up some more with antique crystal chandelier drops). I had a new silverplate mint julep cup that I got at a thrift store which seemed a bit shiny, so I added a pretty torn muslin ribbon, vintage paper, and button as well as a sprig of greenery. Pottery Barn had some magnificent sheet music candles which were sold out (as well as very expensive), so I used a deckle edge scissors and cut my own vintage sheet music and tied it on to the Hobby Lobby candle (half price-a bargain at $4.50) with more twine and another sprig of greenery. What do you think? I'm pleased , so I guess that's all that really matters, but I would like your input because you guys are an amazing bunch of decorating mavens. 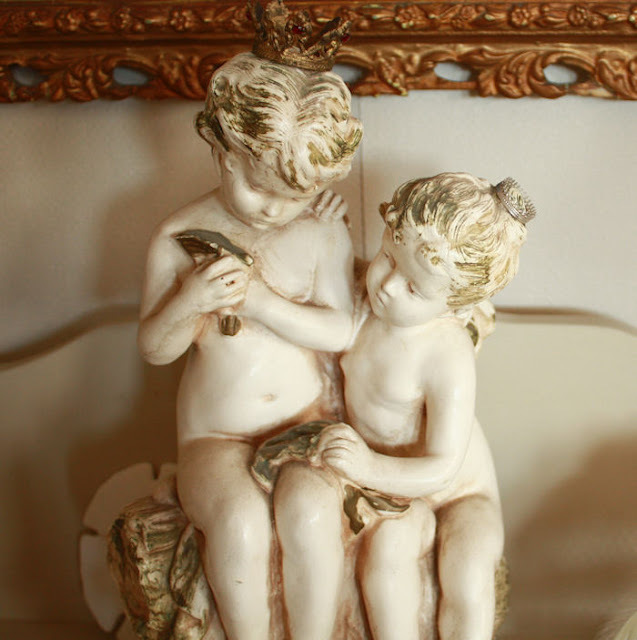 So anyway, pop on over to Kathleen at Faded Charm and get a major yummy yummy fix of the White Wednesday participants' blog posts. I can't wait. I hope you all had a wonderful Thanksgiving. Now, without further ado, we move on to thinking of Christmas. Well, if you are in retail, you have been thinking of Christmas for a long time already, but you know what I mean!Anyway, I love little birds in nests. I think I got that from my mother because she did too. 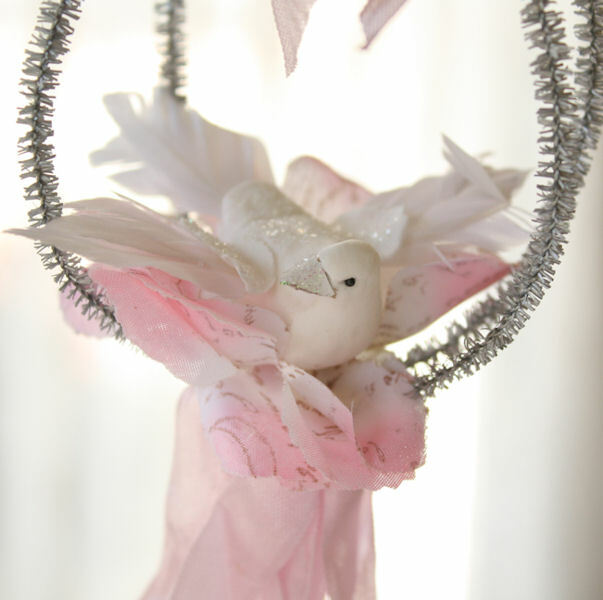 So, I decided to make some pretty little glittered bird ornaments for Our Cottage Garden since it tis the season. 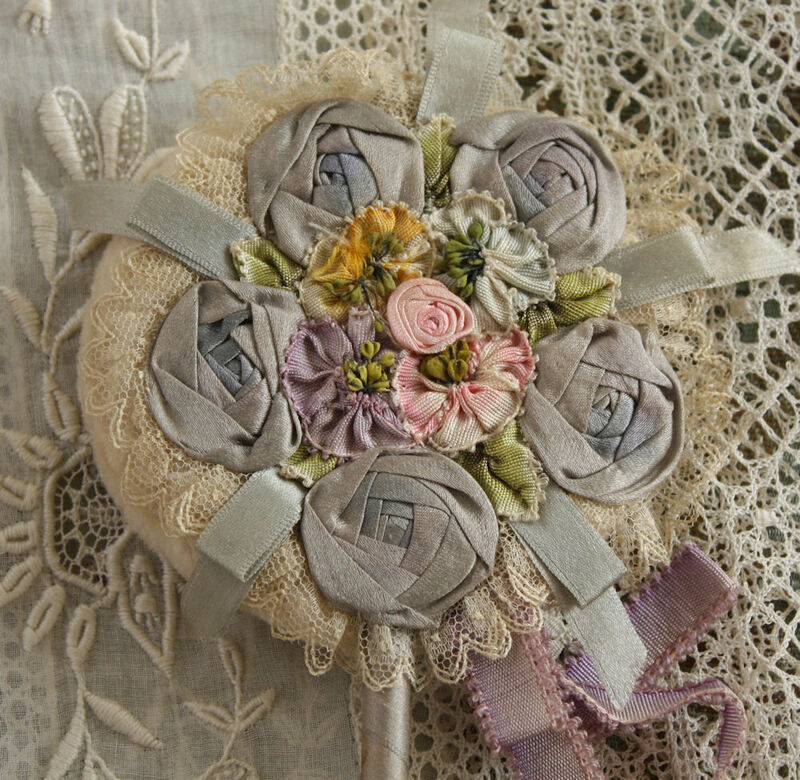 They have lots of pretty vintage seam binding, pink roses for a nest with French script stamped on the petals, and a little tinsel "cage". I thought these turned out really cute, so I had to make one for myself, natch. 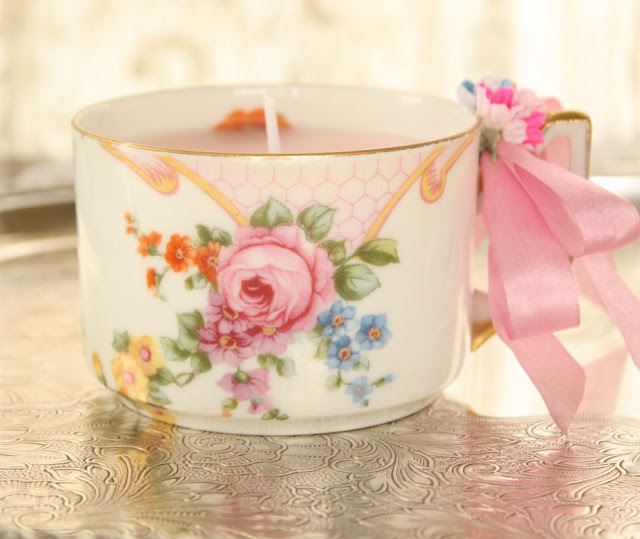 Then,I had a bunch of orphan teacups, some with saucers, some without, and so in an effort to deacquire, I decided to make candles out of them and sell some. The best part is, Mr. French Laundry likes making candles, so he poured these for me and I foofed up the ones that didn't have saucers with some vintage seam binding and vintage millinery. These are also available on Our Cottage Garden. I was pleased with how they turned out as well. I think I'm going to give them to the kids' teachers for Christmas. Now, are you ready for what the little birdie told me??? 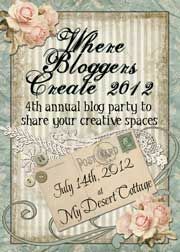 Shhhhhh, this is only for my blogging buddies (if you are reading this, guess what? You're my blogging buddy. YAY! 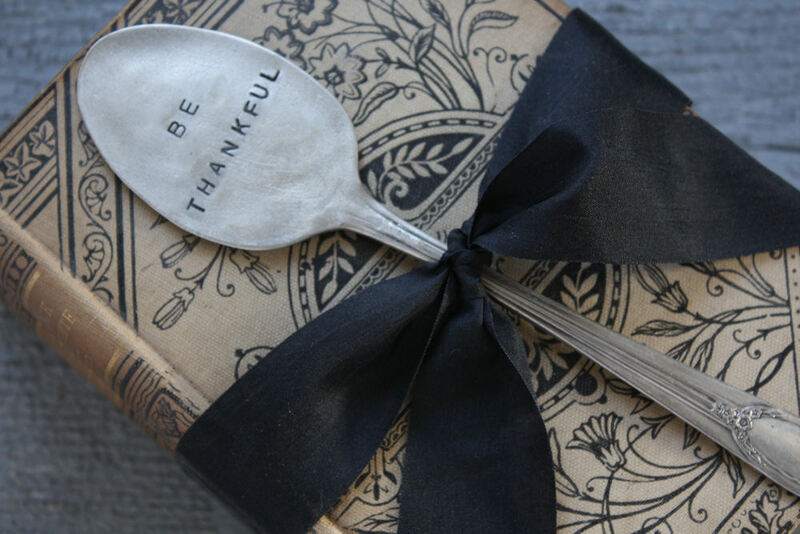 )...if you go over to Our Cottage Garden and purchase either one of these items, type in your Paypal comments "BLOGGER BUDDY" and you will be refunded $2 for each one you purchase. Now this ONLY applies to the teacup candles and the pink birdie ornaments and it will be handled as a refund to your Paypal payment, but it is my little gift to you guys for being so supportive and leaving such nice comments. This offer is good now until MIDNIGHT Eastern time on Cyber Monday (November 29th). 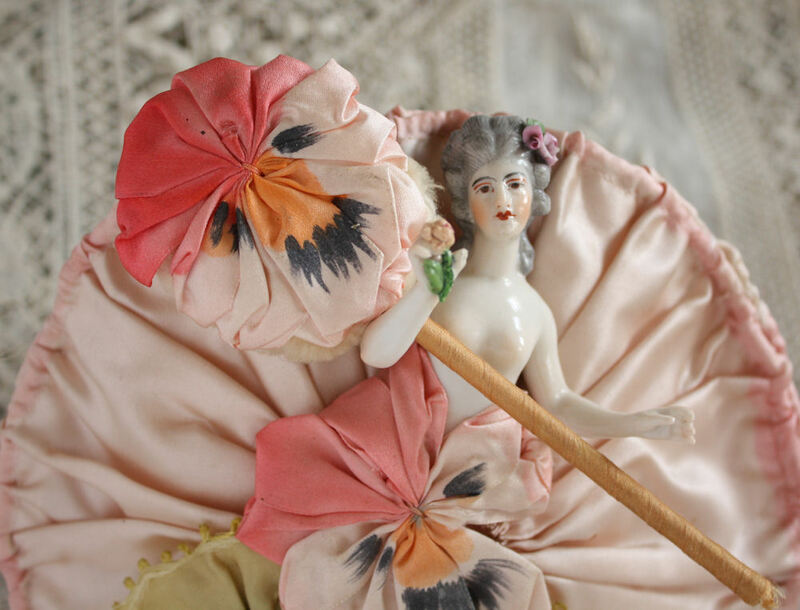 SO, pretty pink ladies, after you go on over to Our Cottage Garden and check out our treasures, pop on over to Beverly's at How Sweet the Sound and check our the other Pink Saturday blog entries. 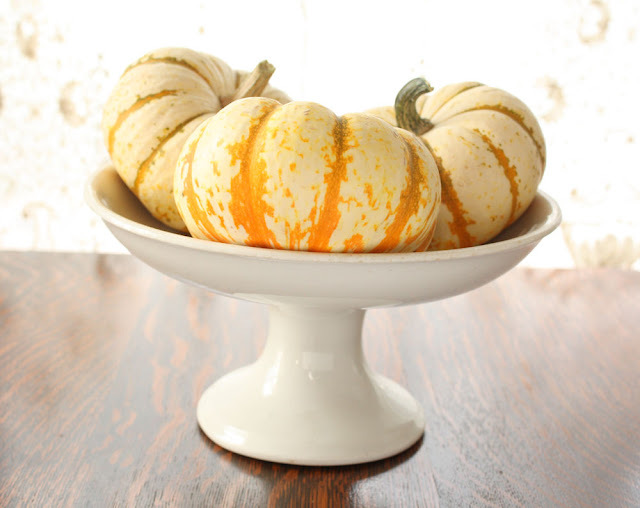 As we prepare for the Thanksgiving holiday, I just wanted to wish you all a happy one filled with warm hugs from loved ones, warm food, and a warm and grateful heart. I know for me personally, it is so easy to get caught up in all that isn't perfect in my life and I know I shouldn't do that because I have so very much to be grateful for. Gratitude...in the face of a less than stellar economy, daily little frustrations with kids, husband, job, a house that never seems to be done or even company ready no matter how hard I try, wanting to do so much and yet still, only finding 24 hours in a day...those extra 10 pounds that keep finding me, no matter how many times I manage to shed them...artistic longings not quite realized and the voice of negativity that pervades my head whenever I do create and says, "you aren't good enough, talented enough, or dedicated enough to stand beside "real" artists". All of these things weigh me down when I forget to look up and thank God for all that I am and all that I have. I am thinking I will try to slow down for one day this week and just be. Be truly present for my friends and family, savor the moment, and be thankful for my many blessings. Perhaps even realize that whatever I am, I AM good enough. And maybe spend a little time out in Blogland over at Kathleen's White Wednesday party (well, I couldn't be COMPLETELY disconnected, could I???). Thanks for listening. Happy Thanksgiving, my friends. P.S. 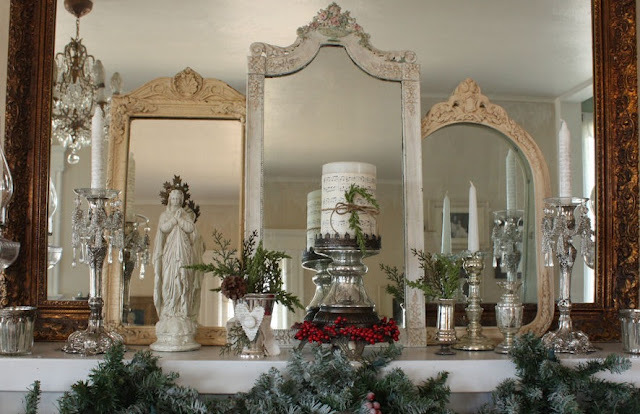 I just updated my Etsy shop, Elegant Farmhouse with beautiful antique white ironstone (more to come this weekend) and some antique grainsack stockings, just in time for Christmas. A Leisurely Sunday Afternoon...I Wish! Just some pretty fallish roses that were on my dining room table ...I had them in a gorgeous antique purple transferware pitcher. 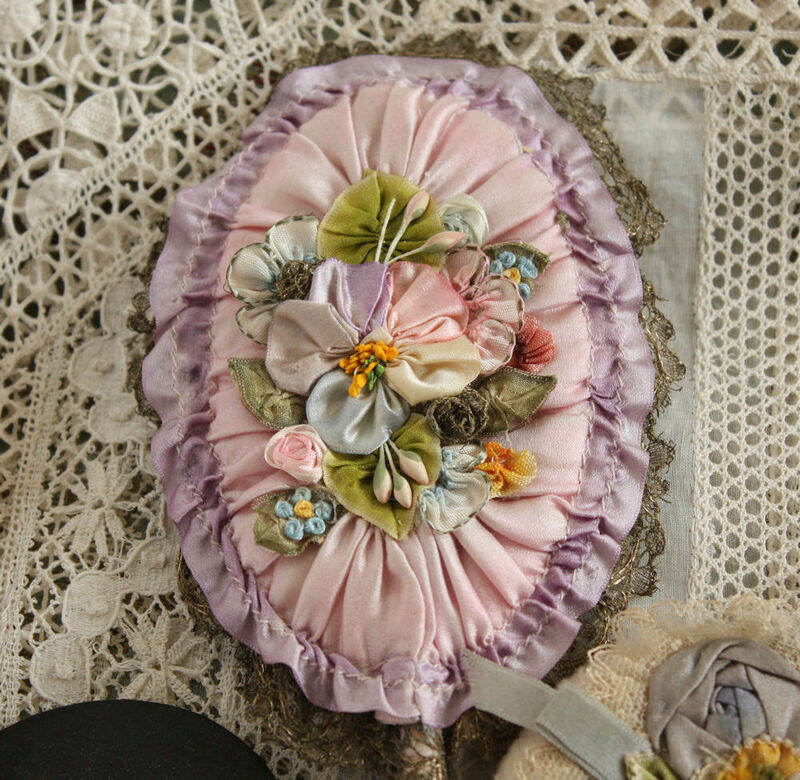 The color of the roses played off the purple transferware for a really beautiful effect. 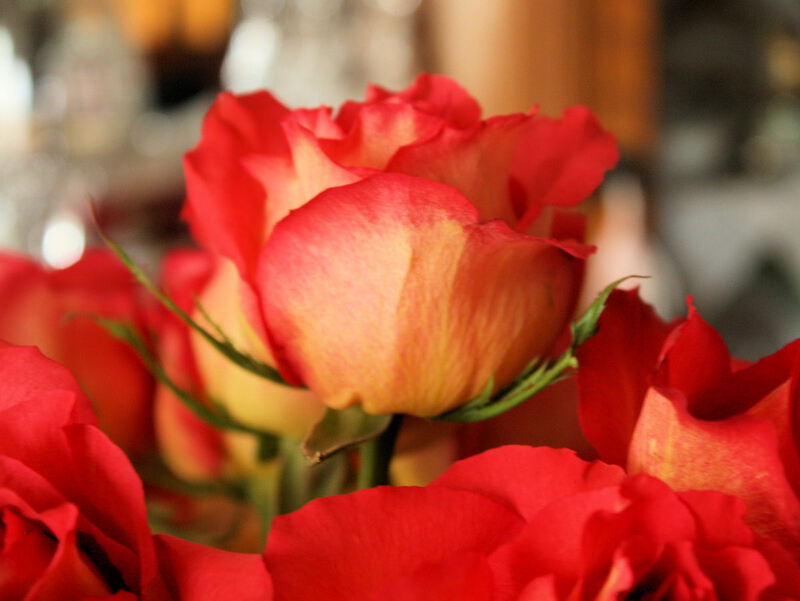 I forgot to take a picture of the entire thing though before the roses mostly kicked the bucket...DUH! What kind of blogger AM I??? And the view out one of my bedroom windows of the big Silver Maple. 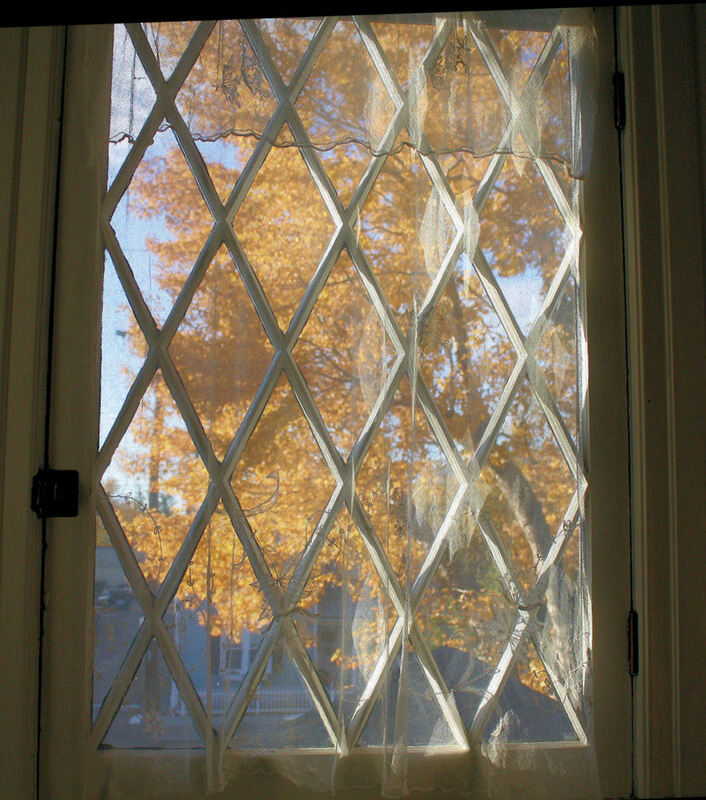 I loved how it looked through the lace curtains with the sun shining brightly on one side. It didn't photograph as beautifully as I had hoped. It was magnificent waking up to it though. Maybe one of these days, I will learn how to use my camera to its full potential! Hope you are having a wonderful leisurely Sunday afternoon with family and friends. I am working on things for my Etsy shop, but my family is hovering all around, so it is still pretty nice and relaxing. 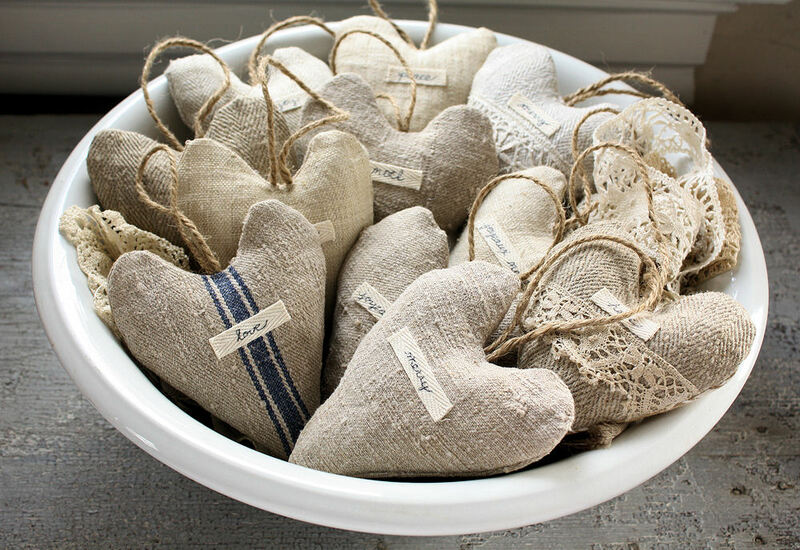 Antique Grainsack Heart Ornaments and....a winner! As promised, I just added some of my little antique grainsack hearts to my Etsy store, Elegant Farmhouse. 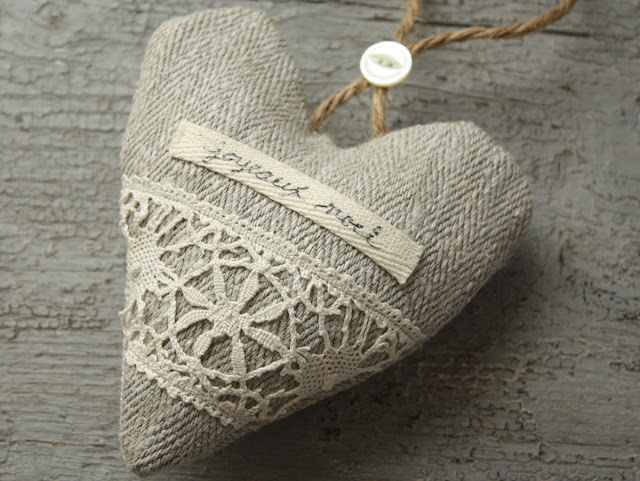 I hope to add a few more as well as some small stockings made from grainsacks as well this weekend or early next week. And, also as promised, the random number generator and I have determined a winner to my Carolyn Westbrook book giveaway. Thank you to everyone who entered and who became a follower, and to those of you who posted about the giveaway on your blog. I loved reading your comments and getting to know you better. Now that the giveaway is over, I am going to try to make the rounds to each follower and say hello. Give me a ringaling Rachel and I will pass on your information to the book publisher and get your pretty package from me all together and on its journey to you. 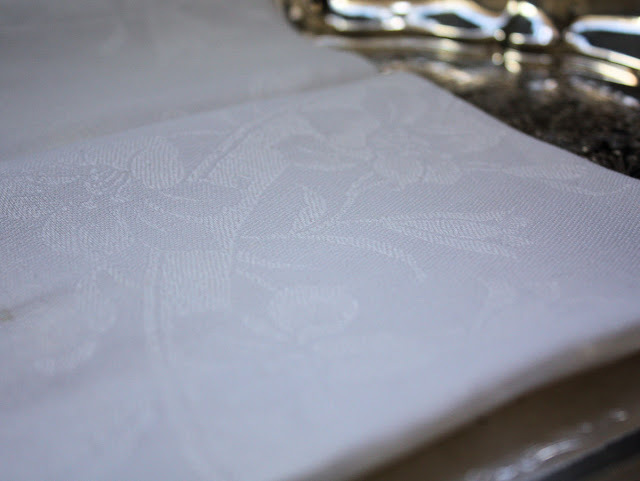 and a set of 6 lovely vintage linen damask napkins. I want you to know how much I appreciate all of the comments and new followers to my little blog. I read each and every one and just love "meeting" you all. So, if you haven't yet entered, just click here and leave a comment on THAT post to be entered. Tick tock, time's a wastin'! Winner will be announced November 19th. Got busy this week but didn't want to miss out on one of my favorite events, White Wednesday. SO, I thought I'd share a totally random photo I took a while back of one of the many re-inventions of my living room mantle. I just love playing with it. I love the layered mirrors and the sparkly crystals and I hope you do too. Pop on over to Faded Charm to visit all of the White Wednesday participants. 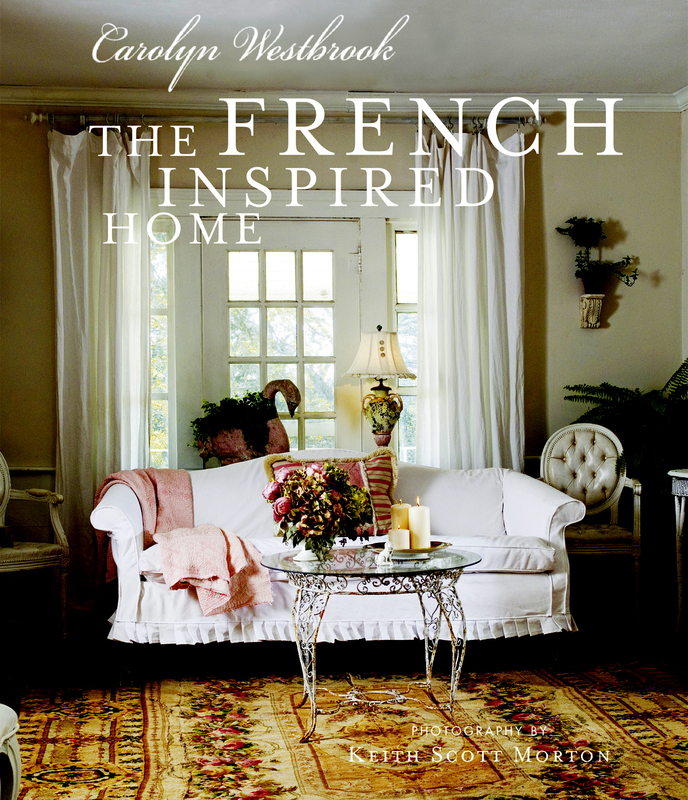 Don't forget there is still plenty of time to enter my giveaway of the new Carolyn Westbrook book, The French Inspired Home. Click here to get to that post. Powder patters, that is. I realized it has been a very long time since I shared one of my collections with you. 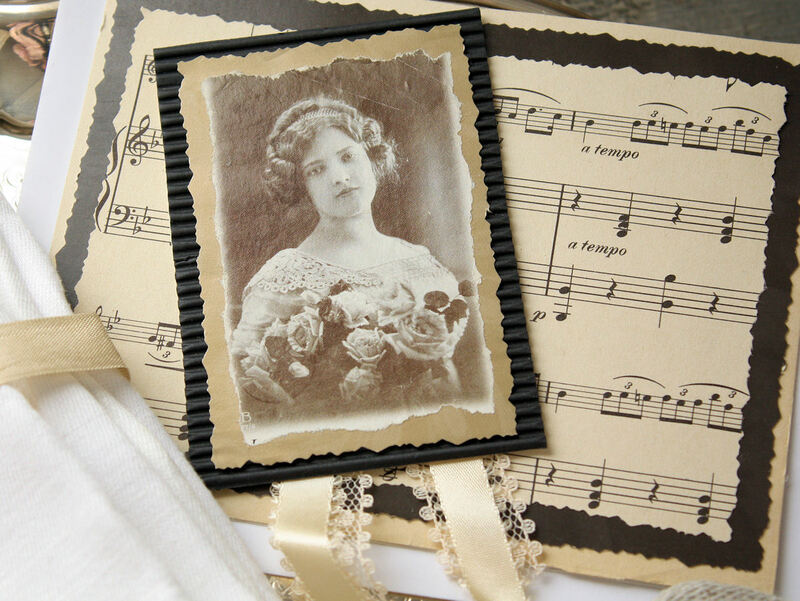 This is a subset of my rather large 1920's French ribbonwork collection. 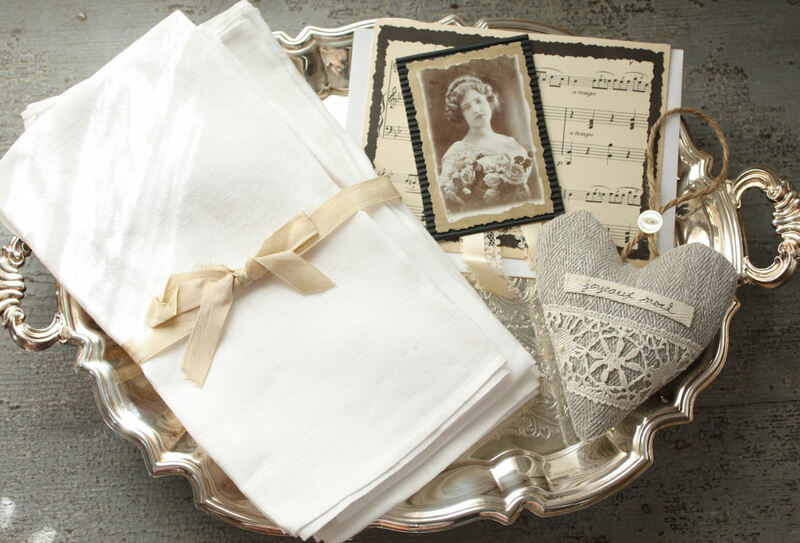 During the 1920's and into the 30's, homemakers loved to make things in their home pretty (some things never change, do they?). 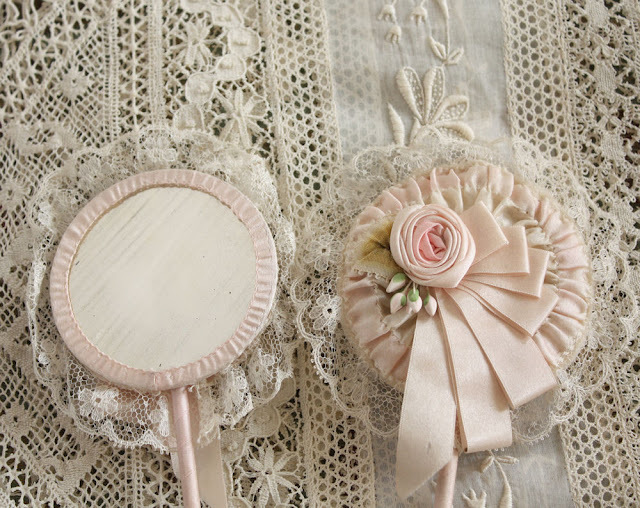 As was very fashionable in the day, they would take boudoir items, vanity items, and clothing and add embellishments to them, making lovely flowers out of ribbons. These ribbons were usually silk and were often incredibly beautiful just by themselves, even before they were manipulated into roses and pansies and other pretty little flowers and leaves. One of the things that was very fun to jazz up was the common powder puff. 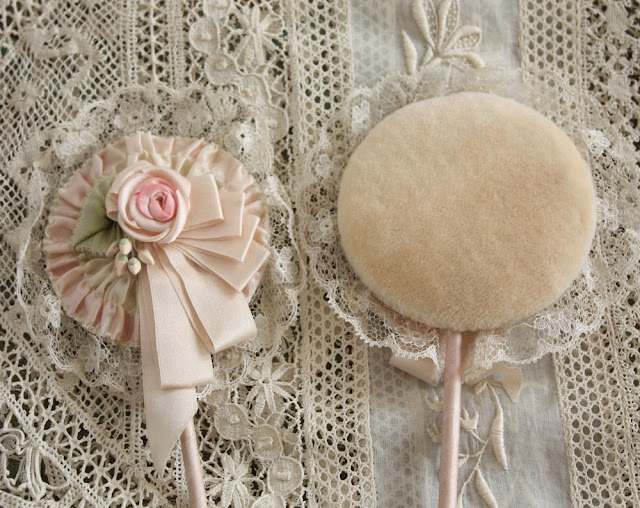 These little powder patters were basically powder puffs on little sticks. 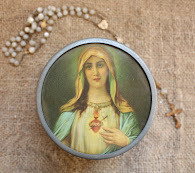 Theoretically, you would apply talcum powder with these little gems, but it is my belief that they were usually far more decorative than something you would use, at least on an every day basis. My collection of these beauties truly makes me smile every time I look at each and every piece. 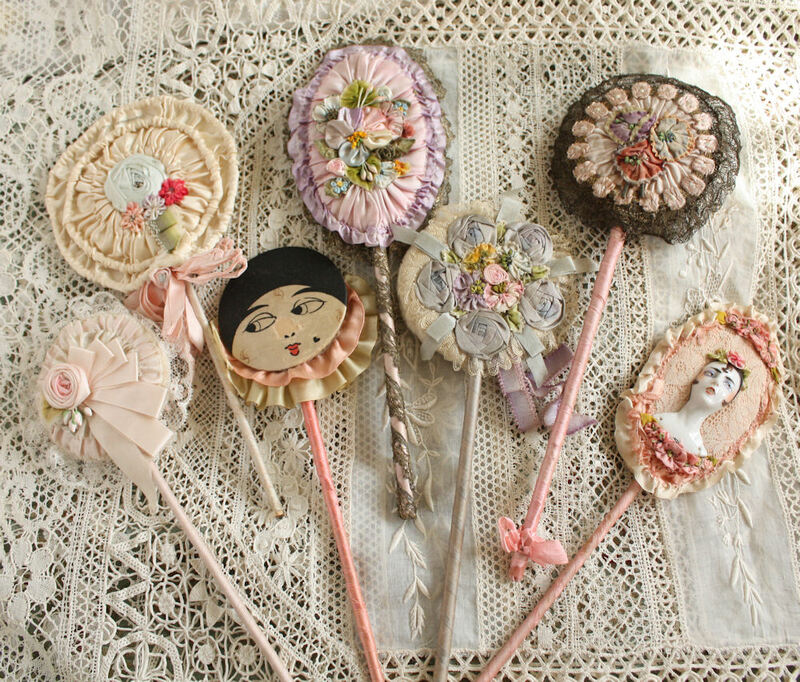 The care which was put into making these little whimsical what-nots is amazing and, of course, they are SO feminine and pretty that I just swoon over them. Sometimes, there would be a set of a powder puff and a mirror. I only have one set of the two pieces and they reside on my vanity table. They other pieces are in an antique curio cabinet along with some other amazing ribbonwork pieces which I may spotlight another time. 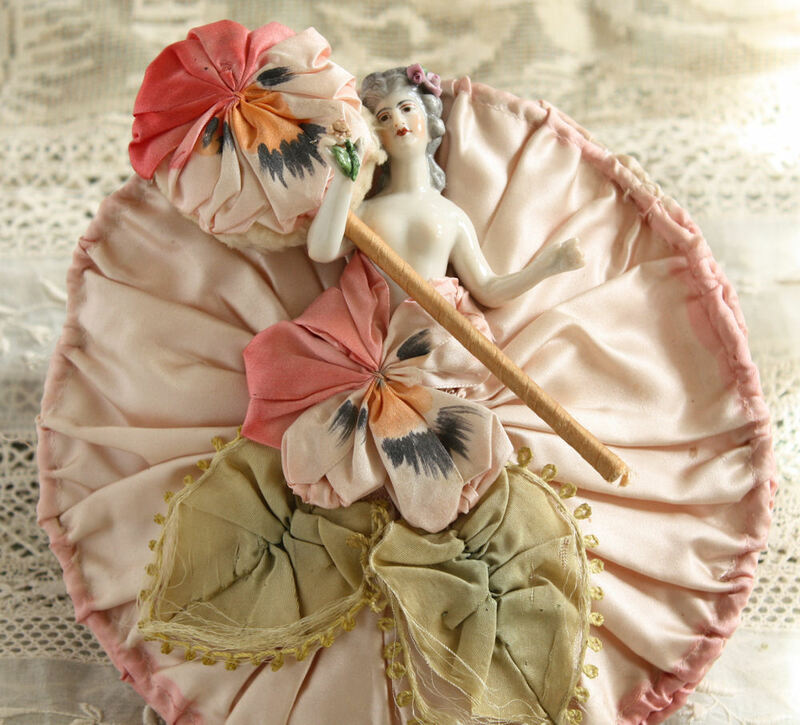 The pansy girl's dress is a large compartment for maybe hankies and then she holds the little small pansy puff. I love all of the pieces in my collection, but I'm afraid this is the one that might have to be pried out of my cold dead hands (oh how morbid!) because she just takes my breath away, even with her slight tattiness. For those of you who love vintage 1940's wallpaper like I do, I've just added some new ones for purchase on my sidebar. 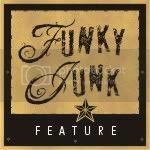 Click the link to see the selection. Note that all prices are per yard and DO include shipping to the U.S. International buyers welcome, you just may have to pay the extra to send it to your location. If you haven't signed up for my giveaway of Carolyn Westbrook's new book The French Inspired Home, click here and leave me a comment on THAT POST to be entered. In the meantime, I'm going to pop on over to Beverly's at How Sweet the Sound to check out all of the fun posts for Pink Saturday. Join me? 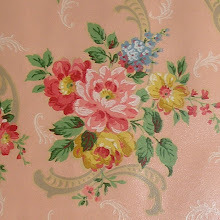 Now that I am back blogging again, I figured I needed to add more vintage wallpaper to my vintage wallpaper page. I meant to do it several months ago, I just hadn't "gotten around to it". Like so many things in my life...SIGH! 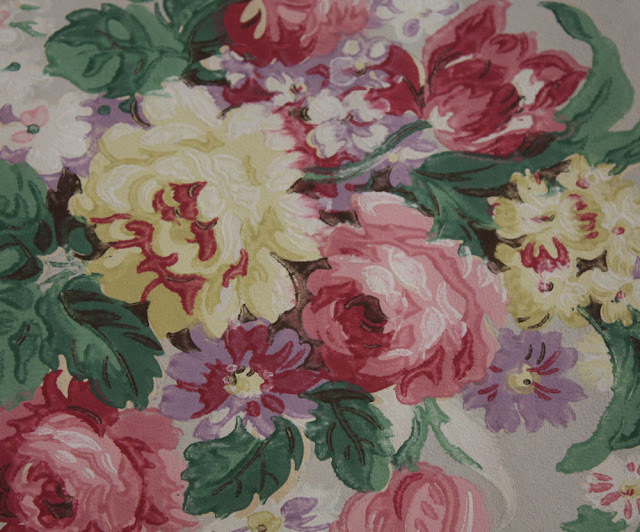 Anyway, I added 4 more beautiful 1940's patterns which are available by the yard (quantities are limited, of course). 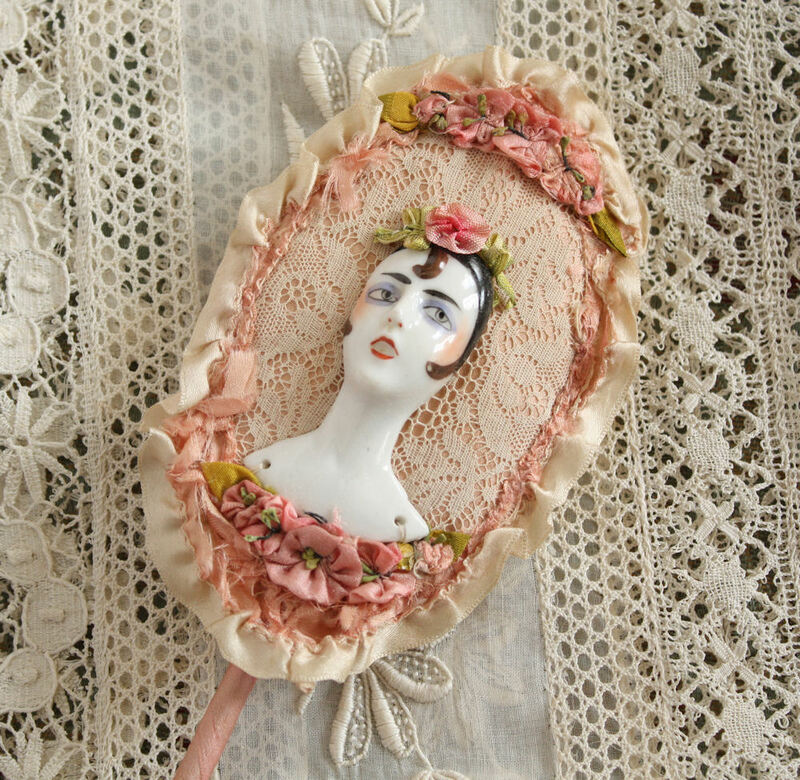 You can access these by going to my sidebar to the Wallpaper Boutique. 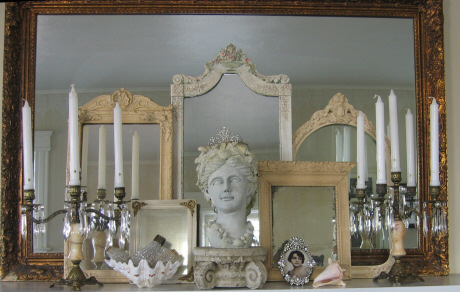 Enjoy taking a peek and don't forget about my giveaway of Carolyn Westbrook's new book, The French Inspired Home. See you back here tomorrow for Pink Saturday! White Wednesday and A Carolyn Westbrook Giveaway!!!! THIS GIVEAWAY IS NOW CLOSED. THANKS TO ALL OF YOU FOR ENTERING. WINNER WILL BE ANNOUNCED ON THE 19TH. GOOD LUCK! Hope you all don't mind, but I'm piggy backing my giveaway with White Wednesday. Seems appropriate, because there's loads of beautiful white in the book below as well as other fabulous inspiration. Pop on over to Kathleen's at Faded Charm to see the other White Wednesday participants. OK folks, the publishers of Carolyn Westbrook's new book, The French Inspired Home, that I spotlighted last week here, have given me an offer I couldn't refuse. They are going to send one of my readers their very own copy of this feast for the eyes. The book will come directly from CICO books, but to sweeten the pot (as if it is necessary), I will also send the winner a few little French inspired goodies that I will be accumulating in the next couple of weeks. I am opening the giveaway today and it will close on November 17th. Post a comment at this post for a chance to win. Become a follower of my blog for another chance to win. Mention my giveaway on your blog, link back to this post, and tell me about it for another chance to win. Do this by midnight MST, November 17th. Easy peezy, lemon squeezy. Winner will be announced November 19th. If you are anxious and don't want to wait, pop on over to CICO books here. You can pick up your own copy of this beautiful book for yourself or as a gift (the holidays are coming you know).